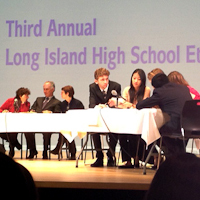 Not much happened at the Third Annual Long Island High School Ethics Bowl. Interlopers from Ramapo High School across the Hudson edged out a team from Bethpage in the final match to take home the honors. Three schools received honorable mention for teamwork, listening skills and responsiveness. That was about it. This is the third year Wendy and I served as judges, and the second in which we wrote or edited the cases. Our friend, Fran Kelly, who served as a judge, took the trip to Molloy College with us on Saturday. Twenty-two teams of intellectually intense highschoolers—their cell phones momentarily silenced—paired off for simultaneous matches. In the first half of each match, one team dissected a case while the other commented on their presentation; in the second half, the roles were reversed for a discussion of a different case. Three judges scored each match. In the first match, one of the teams I judged argued that torture is inherently evil when used for interrogation, but might be justified when used as a motivator in "ticking time bomb" cases. Their opponents, grappling with the ethics of Spanish bull fighting, argued that ancient cultural practices must give way to modern ethical values. We gave both teams high marks. The teams in the second match were not quite so sophisticated. The first case asked if it was unethical for a young woman who bought a house in Lake Tahoe to walk away from it when its value plummeted four years later. They could only insist that people should keep up their end of contracts, no matter what the consequences—a "consistently Kantian position" one student called it. The other team took an analogous approach to the second case, which involved a struggling graduate student who took a job at Rinaldo's, a high-end restaurant that systematically bilked its customers. They didn't like "the air of corruption" about the place and insisted that our hero report the rascals to the authorities. In neither case did they come close to entering the psyches of the protagonists. Their insistence on defending the high ground prompted one of my fellow judges to whisper, "I wish one of them would take a controversial position and make an argument for it". I had to agree. There was one highlight. Reflecting on the behavior of the gang at Rinaldo's, a young woman threw out a quote from Jurassic Park, "They were so preoccupied with whether they could that they didn't stop to think if they should." That scored her team a few extra points. After lunch Ridge and Bethpage squared off over the question of whether it was right for a young woman named Lisa to accept expensive gifts from a wealthy dowager who thought Lisa was her niece, despite the young woman's repeated protestations. One presenter asked us to look at the case "through the lens of feminist care philosophy", garnering high marks from my fellow, avowedly feminist, judge. The second case asked what the directors of a charity that employs recovering drug addicts should do when they discovered that an employee was skimming money to pay medical bills for her neurologically impaired four year old. "Off with her head!" they cried. Keeping her would set a bad precedent. Besides, the child would probably be better off with CPS. Hmmm. When the scores from all matches were tallied, Ramapo and Bethpage emerged on top. They faced off in the big Molloy auditorium to discuss two cases. The first asked if is it right for colleges to include notations of academic dishonesty on student transcripts. The second questioned if is there anything unethical about school districts being paid to show newscasts containing commercials in the classroom. Wendy was one of the judges. The squad from Ramapo insisted that using fear is the wrong approach to the problem of cheating while the Bethpagers argued that bringing ads into the classroom is fraught with potential for abuse. 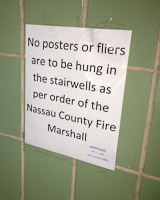 Against their argument that students would have no choice but to view the ads, Ramapo countered that most students don't pay attention during class anyway. Sad but true. When it was all over, the Ramaponians, trophies in hand, boarded their bus back to Spring Valley and we began our trek back to St. James. We had no problem finding material for conversation. Even though not much happened, we had much to talk about. The Long Island High School Ethics Bowl is sponsored by the Squire Family Foundation. 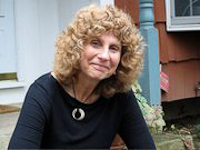 The driving force behind the program is the foundation's director, Roberta Israeloff. Wendy met Roberta through her Philosophy for Children activities.